Coat a 15 x 10- inch baking pan with nonstick cooking spray or line with parchment paper. In a mixing bowl cream butter and brown sugar. Combine flour and cracker crumbs; gradually add to the creamed mixture. Press into prepared baking pan. Bake for 12 minutes or until lightly browned. 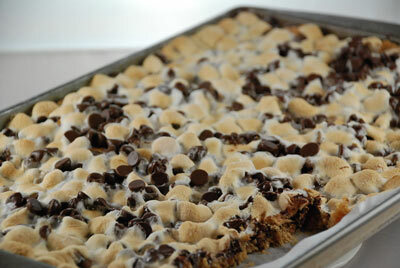 Sprinkle baked graham cracker mixture with 1 cup chocolate chips and marshmallows. Top with remaining chocolate chips. Bake 8 to 10 minutes longer or until marshmallows are lightly browned. Cool on a wire rack. Cut into bars.